I’ve been on a mission. A mission to lose 2.5 stone and become the fittest / lightest I’ve ever been in my adult life. The idea that weight loss has to be some kind of social activity or should be done in tandem with other people is the exact opposite of how I feel it should be done. I feel that if you can do something for yourself, by yourself, then it matters more. It means that in the future, if faced with a similar challenge, you can remind yourself you don’t need to run to anyone for help or support, you’ve done it once so you can do it again. Being able to source that strength from within yourself is like renewable energy. I’m not an expert on health or fitness, I’m just a regular guy who can add and subtract numbers and Google stuff. I believe that was the key to my ‘success’. I deliberately didn’t want to blog about it, nor publish anything online, nor tell anyone in person about my plans. I promised myself it would only be spoken about when the mission was complete. Why the silence? Firstly, other people can’t lose weight for you. Only you can control what you put in your body and how you maintain it. We’ve more information than ever before on diet, food and how our bodies work yet we’re not getting any lighter or fitter. Most people openly talk about weight and can have a laugh about it. It may have been a defence mechanism once upon a time but right now we’ve just normalised being overweight to the extent it’s no longer a problem. Because everyone is in the same boat. Safety in numbers. Children grow up with overweight people all around them so they just accept it as normal and not something that needs to be fixed. The trend continues. However, speaking more generally about weight loss (and this is where I’ll come in for heavy criticism from fitness & health gurus), to me being overweight is only an issue if you feel it’s an issue. If you’re maintaining a constant weight of, let’s say 15 stone when you should really only be 12 stone, then there’s no reason why you can’t lose weight other than the fact you don’t want to give up your current lifestyle. And that’s perfectly fine in my eyes… if someone is overweight, I assume they’re aware of their own weight and are content with it. And being content in life is far more important than being in top physical condition… what leads me to draw that conclusion is a question – it’s a deep, morbid kind of question, but would you rather die suddenly of a heart attack or die because you decided life was no longer worth living? Carrying a few extra pounds and being happy -v- being your ideal weight and being depressed. I know what I’d rather choose, if given the choice. Also, just to clarify, I’m aware that ‘weight’ means nothing by itself. You could be overweight / have a BMI of over 25 but your body fat percentage could be extremely low and you may just have a lot of muscle contributing to your weight. Or you could have unusually low / high body water percentage which could also reduce the significance of the number on the scale. Let’s keep it real though – *most* people don’t need anything other than a mirror and eyes to determine whether they or anyone else are piloting a healthy looking body. Why did I get the sudden urge to lose weight 20 months ago? There was no particular reason or trigger, at least not at a conscious level… it would make a lot more sense in my own mind if I did have a reason but I think it’s just one of these ideas that gets stuck in my head for a while and so I decide to take on the challenge. The best reason I can muster is that I feel that if someone can’t reach peak physical fitness / health in their 20’s, then the chances of them doing it later in life decrease. So perhaps I wanted to prove to myself that I could do it and that it would be easy if I were motivated enough… all it would take is some mental steel. The same formula necessary for achieving any long-term goal. Other possible reasons? I’ve always wanted to improve speed and endurance when swimming. I could beat anyone in sprints but would have to admit defeat in long distance. I’ve always thought it would be a good feeling knowing that no matter who ends up alongside me in a pool, I could destroy them if I really wanted to, either in a sprint race or in a long distance race. However, I don’t swim competitively so I’m not sure that was a huge motivating factor. Another motivating factor may be the fact that I tend to switch off any time someone starts talking about diets / weight / fitness as it’s not something I’m very passionate about. However, being able to speak from a position of experience might make me more interested or more ruthless in diverting conversation on to other things. People don’t want to listen to “it’s easy, just stop talking and do it” advice as it diverts the focus of conversation on to the individual’s lack of discipline and commitment which is the route cause of the problem. That’s the kind of advice that starts wars but at least if I’m ever asked for my thoughts on the matter, I’ll be able to speak from a position of more authority and share my thoughts and experiences. The idea of losing a couple of pounds however was just too easy. I mean that could be done in a day. In the past when I’ve been sick over a couple of days, I’ve noticed myself losing about half a stone. Granted, that involves not eating anything for a couple of days which is unhealthy but it means that in theory you’re a few days away from being half a stone lighter… so I wanted a bigger challenge, something that sounded relatively impressive without getting stupidly thin and losing all sense of reality (don’t worry, I don’t feel there’s any danger of that happening… I could easily have a Big Mac meal and a large bag of Doritos with a sour cream dip.. throw in some KP salted peanuts and a large Fanta while you’re at it… it’d be rude to refuse a big bag of pick ‘n mix too…). I determined (in advance of losing any weight at all) that 11 stone was probably my optimal weight, but obviously it would depend on whether or not I’d built any muscle and how I looked / felt. I was 13 st 7 pounds on August 1st 2012, so if I could get down to 11 stone, I’d have a BMI of just under 21 which is normal but closer to being underweight than overweight. The goal had been set. Lose 2.5 stone. Not ‘by any means necessary’ but in a slow, steady & sensible kind of way. I didn’t put a time limit on it. The first thing I did was to sit down and look at the facts. I didn’t want some liquid ‘lose weight overnight’ diet nor did I want some ‘all you can eat of x, y, z diet’. Instead I boiled it down to its simplest format. Calories. Everything has a calorie count. It’s generally accepted that a calorie controlled diet is probably the most flexible way to lose weight without snookering yourself in to eating certain foods. If I want my breakfast, lunch and dinner to consist entirely of Mars bars, I should be able to have that option (I can see fitness instructors face-palming right now). Monitoring calorie intake gives me that flexibility. It suits me best. I calculated my optimal calorie intake for my height, weight, gender, activity level etc… it was pretty much the average 2500 calories per day if I wanted to *maintain* weight. In order to lose weight at a rate of 1 pound per week, I needed to create a calorie deficit of 500 per day, so that gave me a net calorie allowance of about 2000 calories per day. Another reason I wanted to stick to calories and nothing else was because I wanted to associate all food and drink with weight. I didn’t want to eat or drink anything and not think about it. Up until I started this, I’d never really done that… I’d just stop eating when I felt I was full or I’d eat if I felt hungry. I wanted to see if things would change if I were to be consciously adding up calories every time I ate something. Change it did. From day 1 I was very conscious of the calorie count on everything. Bananas, apples, butter, bread, milk, chocolate, beans, ham, potatoes, pasta.. it was very easy to Google any food and get a fairly accurate calorie count for it. My gut reaction was to make do with as few calories as possible early on in the day so I could hoard them all up for later in the day should I need them. I quickly realised that wasn’t terribly smart and it didn’t last long, but it did immediately stop me snacking for the sake of it. Wake up at the same time every day, no exceptions. Go to bed at the same time every night, no exceptions. Eat the same breakfast every day. All of those decisions led to me successfully losing the weight, dropping body fat %, losing inches of waist etc.. in fact that’s why i bought myself one of those belt-hole puncher things… my old belts were no longer tight enough because my waistline had shrunk from about 33/34 inches to 30/31 inches. A wonderful problem to have. By increasing time spent exercising, I also made sure I wasn’t simply losing weight, but I was keeping myself fit and toned. I’ve never really liked gyms so my usual routine is 1km swimming per day at least 5 days per week. Some press-ups & sit-ups thrown in to mix it up. It might sound like a lot but it’s not really… the swimming gets easier as time goes on and I can now easily swim for 1km non-stop, 7 days a week on occasion. At the start of all of this, I’d be out of breath after swimming 5 lengths non-stop of a 16m pool, I’d be out of breath after 10 press-ups and my ab muscles would hurt from doing 10 sit-ups. So it’s not as if I started off in decent shape. It took time but the main ingredient was persistence and keeping focused on the end goal. I’d calculated 1 pound per week was the maximum I could lose and in the end I averaged a loss of about 0.5 pounds per week. Too slow for most people who seem to believe they can lose a stone overnight, but I trusted my math and my plan and I knew that over a long period of time, it would all come good if I kept faith in the numbers. Part of the problem of disclosing your goals / the fact you’re trying to get fitter is that you’ll get conflicting information from just about everyone. Bananas are fattening… bread is bad… you need 5 fruits a day but you also need to balance it with fat, sodium, iron etc… situps are bad for your back, tea dehydrates you, tea hydrates you… it’s enough to make your head explode which is why I did the research and math up front, didn’t deviate from the plan and kept my mouth shut throughout. Ah, the bit everyone looks forward to. Also, the bit where you get jealous that this person appears to be much fitter / better / happier than before. For a brief moment, your eyes are entertained and then you turn attention to yourself and realise you don’t have a success story like that *sobs*. I know the drill. I frequent news sites too, hoping to read news but ending up seeing fat or thin celebrities on a beach somewhere in the Caribbean. Luckily for me though, I’ve never had long-lensed paparazzi following me around trying to get an unflattering photo to use in an article about fat z-list celebrities to be published in January / February time when the ads for diet plans and beach bodies are on the rise. The incentive for those guys to lose weight is the fact that they can get paid to write about it and tell their story in 12 months time. Pretty big incentive most people will never have. 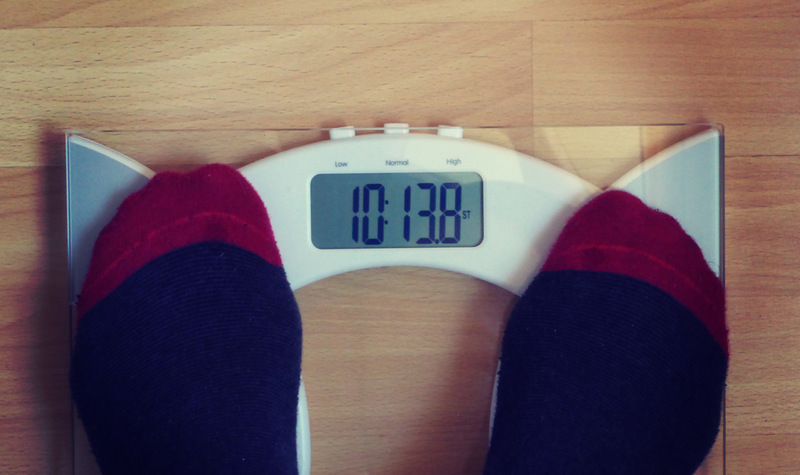 And just to prove I’m not making it all up, here’s some evidence with both of my feet planted on the scales… 10 stone, 13 pounds and 8 ounces as of this morning. Losing weight is only important if you’re trying to lose weight. For everyone else, it’s quite annoying as the implication is that everyone needs / wants to reach their target weight in order to be successful or to win at life. I say that’s not the case… it’s merely one of *many* ducks that must line up in order to reach self-fulfillment, which presumably is the goal for everyone. However, there’s no reason why you can’t state a goal up front and just do what I did – ruthlessly stick to a plan, place your faith in numbers and execute day after day. Nobody has to know, you don’t need to join a club, you don’t need to eat lettuce and apples all day long. You just need to have a well thought out plan and stick to it. Day in, day out until the objective is complete. If that sounds like too much work, just accept your current weight and don’t worry about it too much. Invest the time you save thinking about weight in to something productive that you can actually do / achieve. The confidence and feel good factor you get from accomplishing things may lead you to tacking weight at a later date. Step 1 – achieve the goal. Step 2 – don’t allow Step 1 to become a goal again. I’ve done the hard bit and it would be careless of me to simply abandon whatever it is that has worked for me. I love stats and graphs so I’m now logging my vital stats on a weekly basis in order to keep myself in check. If I were my own enemy, this is an area where I’d be hoping I’d slip up… I’d feel now that the goal has been achieved, I’ll relax and be caught off guard and start slipping back in to old habits. That won’t be the case and 20 months from now, I’d expect to be the exact same weight I am today, so I’ll have to come back in 2016 and see if that is indeed the case. As for going further / bulking up, that probably won’t happen. I can and will work on lowering body fat % a bit more (which is currently at 12.8%) but overall, I’m quite content to drop anchor soon, chill out and enjoy being in my current position.